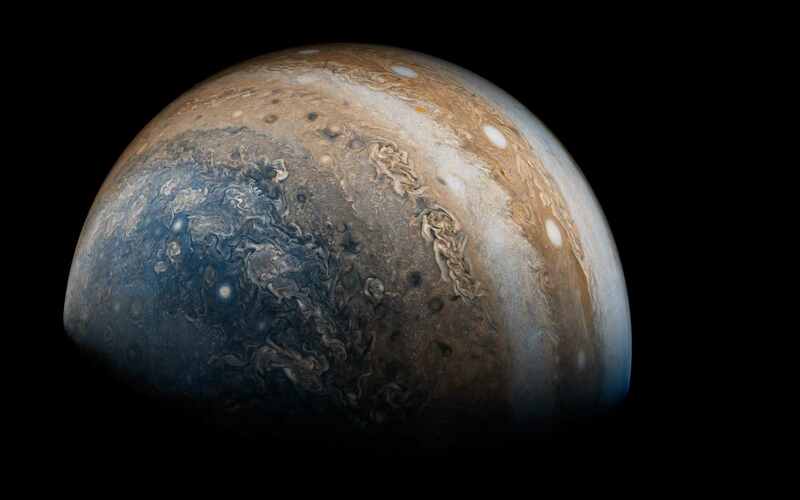 This week, a suite of 46 separate scientific papers describe different aspects of the giant planet Jupiter, from its massive polar cyclones, to its complex magnetic field, to its unique radiation environment. The papers mark the first full scientific results from NASA’s Juno mission, which arrived in orbit around Jupiter last summer. Later this July, the craft is slated to overfly the planet’s Great Red Spot, bringing back still more data. 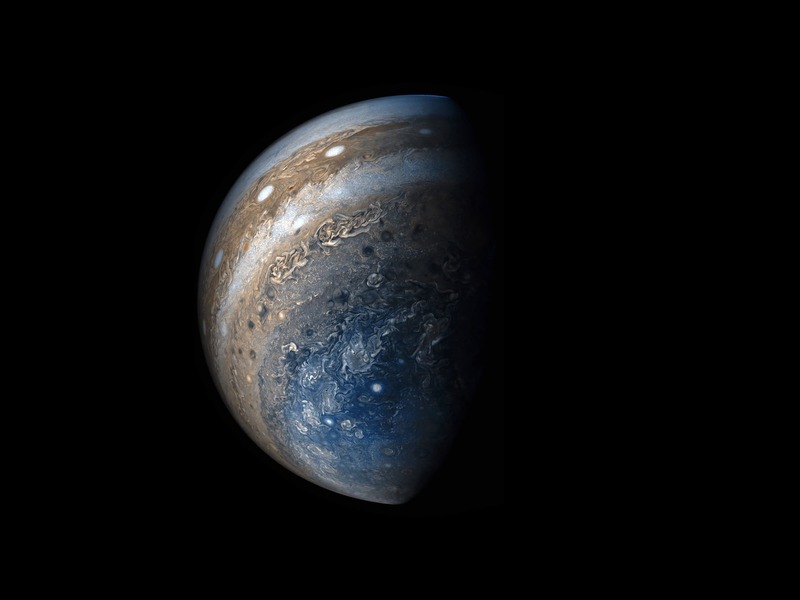 Juno program scientist Jared Espley and Juno radiation monitoring investigation lead Heidi Becker join Ira to sum up some of the Jovian surprises, as well as give a preview of what still lies ahead for the Juno mission. Jared Espley is Juno program scientist at NASA’s Goddard Space Flight Center in Greenbelt, Maryland. Heidi Becker is Juno radiation monitoring investigation lead at NASA’s Jet Propulsion Laboratory in Pasadena, California. IRA FLATOW: This is “Science Friday.” I’m Ira Flatow. Our largest planetary neighbor, Jupiter, has always been an object of fascination, right? Just Google “Galileo.” For him, it was the moons. Later we all wondered what’s going on under those bands of swirling clouds? And what’s the deal with that big red spot? Anyhow, what’s going on there? HEIDI BECKER: Thank you. Hi. IRA FLATOW: Yeah, hi. All right, Jared. What’s the biggest surprise you’ve gotten so far? JARED ESPLEY: Well, like you said, Ira, we’re trying to understand what’s going on inside of Jupiter. We’re trying to understand what’s beneath those beautiful clouds that we’ve all seen. And so as we’re trying to probe the interior of the planet, we’re really starting to get some surprises about what’s going on on the inside– interesting surprises about how the magnetic field is produced, interesting surprises about how the core is distributed on the inside of the planet, and how the different atmospheric parts, components, constituents are distributed inside the planet. IRA FLATOW: Mm-hmm. But the outside, I mean, the atmosphere has certainly been surprising. We’ve seen pictures of huge cyclones at the poles. JARED ESPLEY: Yeah, those things are awesome. So we’ve got cyclones at both of the poles. These are unexpected. We’ve got these really powerful bands and belts that we’re all familiar with. But we see these cyclones that don’t really look anything like what we see at the equator. And like you said, they’re circling around, swirling around the northern pole. They’re interesting scientifically, and they’re just awesome from an artistic, aesthetic point of view as well. IRA FLATOW: What are they made out of? JARED ESPLEY: So the primary atmospheric constituents of Jupiter are hydrogen and helium. So they’re also predominantly made out of those. But exactly how they’re– the different components are still being analyzed. IRA FLATOW: Wow. Heidi, going into this, one of the big concerns was all the radiation around Jupiter and whether it would literally fry the instruments. How’s it doing so far? HEIDI BECKER: Well actually, Juno is doing amazingly well. And that was the real nail biter for us because we’re going someplace that nobody has ever flown before. So we didn’t really know what would happen the first time we flew close to the planet. And it actually turns out that really close to the planet, it’s a lot less than we were anticipating it would be, which is really great news. It’s actually 10 times less than we modeled it to be very close to the planet. So Juno’s doing just great. IRA FLATOW: So that’s another surprising thing about the radiation so close to the planet being less than you thought. But Juno was really armored well for any sort of circumstance it might encounter. HEIDI BECKER: That’s exactly right. It’s basically an armored tank, and when you fly someplace where things could be really nasty, you don’t want to take any chances. So we’ve got a 400 pound metal vault that all of our electronics are in. And you just don’t want to take any chances with that. So the armor is working. And there are other places further from the planet that are going to be pretty nasty, so we’re going to need that suit of armor. IRA FLATOW: Mm-hmm. Heidi, at the press conference yesterday, one of the things you shared with us was a picture taken from within Jupiter’s rings. Now a lot of people don’t realize Jupiter has rings. IRA FLATOW: But it’s always gripping to see the night sky from another world. You could see Orion from Jupiter. HEIDI BECKER: Yes, it’s amazing how similar the heavens look from another planet as they do on Earth. It’s basically what we’re used to when we’re looking up in the night sky. And that’s how we navigate. We count on that. We have cameras that take pictures of the stars, and basically connect the dots, and figure out which way we’re pointing. So that’s how the engineering works, but it’s beautiful to see it in a picture. IRA FLATOW: Now Jared, describe a little bit of the orbit that Juno is taking. It’s really very elliptical, right? It goes way out, then comes back, and then dives in for a few hours and takes like two or three hours of data, and then goes back out again? JARED ESPLEY: Yeah, that’s exactly right. It’s a 53 day orbit, as you said, which makes it very elliptical. That means that when we come screaming in super close to the planet, it’ll last just a few hours. And then we go way out far into the space around Jupiter, what we call the magnetosphere, and make interesting observations of the charged particles, the plasma out there, and then come back in again every 53 days and start building up this network, this web of observations. Because every time we come in, Jupiter has rotated slightly as our spacecraft has come in at different times. So we see a different part of the planet. IRA FLATOW: Mm-hmm. And those bands we were talking about a little while ago, it’s interesting– how deep do the bands go? Do we know that? Will we know more once we can get more information back from the spacecraft? JARED ESPLEY: Yeah. Like I said, that’s actually one of the main science goals of Juno is to try and understand the interior beyond that superficial layer. And so in fact, one of the really interesting results that we’ve already gotten is that there is a equatorial band that goes very, very deep. There’s ammonia, that goes very deep into the atmosphere. But in other regions, it seems to not be banded in the deep atmosphere like it is on the surface. And so why that is is frankly, still a mystery. And of course, that’s what we want as scientists, is mysteries to try and understand. IRA FLATOW: I know besides the bands, when I look at my backyard telescope at Jupiter you see the bands, you see the moons, and then you get to see a little bit of the red eye on Jupiter. Are you going to get close to that thing to take some good, homemade pictures there? JARED ESPLEY: Yeah, that’s right. We’ll make our homemade pictures for all of humanity for our spacecraft. 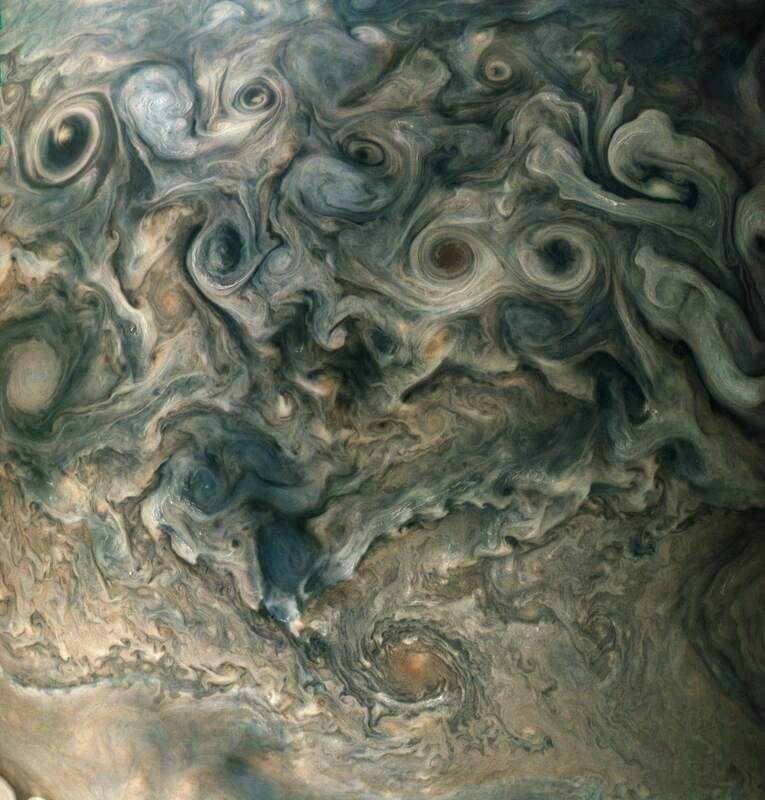 It’s the great red spot, like you’re talking about, that’s that great huge storm that’s lasted for hundreds of years. And in fact, on our very next close pass, we’re going to fly more or less directly over that. So we’re really looking forward to getting good observations, both superficially with our camera, but also especially with our instruments that can look inside of the planet and try and get an understanding of what’s going inside. IRA FLATOW: Mm-hmm. Heidi, what’s the time frame for the rest of the mission? It’s going to keep doing its loops, and then what happens? HEIDI BECKER: It keeps doing its loops. And then we have to get rid of Juno. Eventually, we’re going to have to make sure that we don’t smash into some other body in that system and contaminate it. We’re not a perfectly clean spacecraft. We brought a little bit of us along with it. So unfortunately, we’ll have to say goodbye at some point. But it looks like Juno is going to last a long time. IRA FLATOW: Mm-hmm. Now how far in till its last x number of minutes can you keep collecting data? HEIDI BECKER: Well, that’ll depend on what’s still alive and able to talk back to us. I think we’ll keep listening as long as we possibly can. IRA FLATOW: Mm-hmm. Jared, any ideas about that? JARED ESPLEY: Yeah. I mean, Heidi’s right. It’s kind of not exactly knowable. The interesting thing, of course, is as we get deeper and deeper in the atmosphere, we’ll be turned away from our robotic extension. Our robot or spacecraft will be turned away from us here at earth. So we won’t be able to directly get transmissions through our radio antenna as easily. So at the very last end, our extension will be by itself crashing in a glorious way into the atmosphere of Jupiter. IRA FLATOW: And then let’s talk a bit more about the core. Is Juno upsetting our ideas of what we think is at the center of the planet? JARED ESPLEY: It is, absolutely, which is what we wanted to do. That’s what you want to do in science is explore new things, and we are. It turns out that Jupiter’s core is definitely not the way we expected it to be. The magnetic field that comes from that interior is thought to be planet-wide, but it also looks like there’s very small spatial scale features. So that means that there is something much closer to the surface that’s contributing to the magnetic field. And frankly, that’s a real mystery and really exciting to see that there might be multiple sources of the magnetic field. IRA FLATOW: You mean there could be another core? Couple of cores, or other bodies in there, or what? JARED ESPLEY: Yeah, that’s a good question. We don’t think it’s cores, plural, per se. There probably is the main magnetic field that’s being produced by the core. And then whether or not there’s a secondary dynamo, a secondary source of magnetic field closer to the surface and a layer of conducting material, or whether or not that main core just has lots of small scale features that manifest themselves close to the surface, we frankly don’t know yet. But we will soon. Because that’s why we’re doing multiple orbits to create that web of observations, like I said, from different parts of the planet. IRA FLATOW: So can you actually construct like a 3-D picture of what the core looks like? JARED ESPLEY: That’s literally what we’re going to try and do. IRA FLATOW: Wow. I want to be in the room when that happens. I’m also fascinated by, Heidi, when you talked about the desire and the need to smash Juno into Jupiter because you don’t want to contaminate any of the other moons. IRA FLATOW: Because we may be sending spacecraft to those other moons, and you don’t want bits of contamination there. HEIDI BECKER: That’s right. The rule is to not contaminate. That means you have to say goodbye, unfortunately. IRA FLATOW: Because you know, I think people think that the spacecraft are literally sterile when we send them up into space, but they’re not. HEIDI BECKER: Some of them are, but it’s a very challenging thing to do, as you can imagine. It’s a very intricate spacecraft, and every little piece has to be perfectly clean. So that’s a hard thing to do. It’s not something that Juno was able to do. IRA FLATOW: So what’s the last date we’ll hear from Juno? What’s our schedule here? JARED ESPLEY: We’re expecting to see Juno continue for the next few years. We have a plan to have it keep funded for the next couple of years. And then we also are hoping to be able to continue the science that we’re doing into the future. There’s the spacecraft’s healthy, and we have no doubts that we’ll continue to get good science. IRA FLATOW: And then of course, later on we have the demise of Cassini, too. That’ll be hard saying goodbye to that spacecraft. JARED ESPLEY: Yeah, it’s a neat thing because there are robotic extensions into the solar system. We humans have created these things. We took the ingredients that make up us and changed them into robots, and they’re out there looking for those ingredients out in the cosmos. So it really does kind of give you an emotional connection to the cosmos as you’re exploring. IRA FLATOW: Very poetic, very poetic, Jared. Thank you. Thank you both for taking the time to be with us today. IRA FLATOW: You’re welcome. Juno program scientist Jared Espley, based at NASA’s Goddard Space Flight Center, and Juno radiation monitoring investigation lead Heidi Becker at NASA’s JPL out there in Pasadena.